You know pretty much all you need to know about David Tlale’s inspiration simply by looking at the clothes coming the down the catwalk. The rich colors seem to be touched by a bright, burning sun. The patterns are bold and graphic, the dresses, loose and flowing. The influence of his South Africa home are everywhere. His choice of fabrics and textures, too, show his connection with his homeland: crepes, brocades, raffia, chiffon and soft Egyptian cotton. But a real standout was a body-hugging, lame gown that looked like liquid gold. His menswear was as bold as his women’s line, and definitely not for the faint of heart. But his tailoring was, as it always is, impeccable and even a long, flowing… shirtdress just screamed comfort, for the right man. 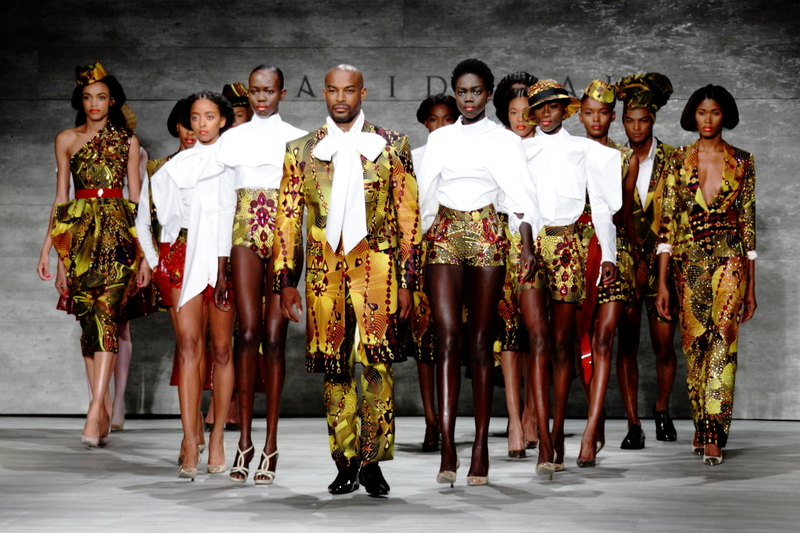 And the right man wore it down the runway: Tyson Beckford. There is little in this collection that wouldn’t flatter just about any figure, at any age. While his styles may suit a wide variety of women, they are so distinctly his. I have been fortunate enough to see nearly every one of his NY runway shows, and watching him grow as a designer has been a joy. David Tlale is, arguably, the most popular designer in South Africa. And it’s not all about the fame and fortune for him. His clothes are manufactured there, and he devotes both time and money to an organization dedicated to ending the poverty in some of the townships, so it’s easy to be a fan. I can’t wait to see what he sends down the runway next season. This entry was posted in Fashion and tagged Anton Brookes, David Tlale, Debora Fougere, fashion, Lincoln Center, MBFW Spring/Summer 2015, mercedes benz fashion week, New York Fashion Week, Red Stiletto Media, runway. Bookmark the permalink.